One of the most spectacular weathervanes made here at West Coast Weather Vanes is the Stagecoach weathervane shown here. Historically, the antique weathervanes that have typically commanded the highest price at auctions are of important American Folk Art and are horse drawn vehicles. With all their complexity, they really give weathervane makers a chance to strut their stuff. Of course, less elaborate designs, such as silhouette Stagecoaches, are not only possible but would also make beautiful weathervanes. 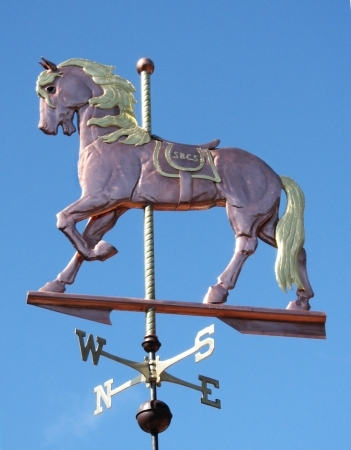 We are chomping at the bit to create more weathervanes in this genre so if you have an idea you’d like transformed into a horse drawn weathervane, please give us a call or email us. We are in the process of adding all 800 existing weathervane designs to our site. Rest assured that if you don’t see an old favorite here yet, we still have it! Just give us a call 831.425.5505 for details.